To provide a quote on any of our wooden garage doors we need to know the sizes required, at this stage a rough idea of the sizes is ok (within 25mm/ an inch in height and width is fine at this stage). Once you’ve had a quote and you’ve decided to proceed with an order then we need exact measurements. Providing your approx measurements are not too far out then the price should not really be effected – if you’re unsure then give us a ring on 01745 362444 to double check your quote. 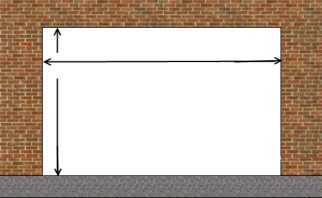 To make the garage doors we need the following measurements, height and widths. Need a garage door frame? When measuring up for your garage doors (or doors & frame), measure your opening in three places in height and three places in width. Got a door frame already in place? If you’re going to re-use your existing frame then again we need the tight measurements in width – this time from within your frame where the doors would sit when they are in place. 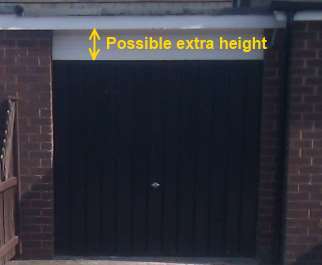 In height we need the measurement from the floor again to where the garage doors would sit once they’ve been fitted. In an ideal world, your garage door opening would be perfectly square, but it doesn’t often happen like that! To be on the safe side, measure the opening in width at the top of the garage opening, middle and bottom and let us know all three sizes. In height measure in three places again, left hand side, centre and right hand side and again let us know all three measurements. If you are in any way unsure of measuring up then please give us a call on 01745 362444 as we are happy to advise. Replacing an up and over garage door? 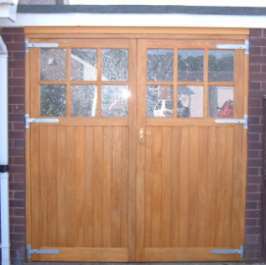 If you’re intending to replace an up and over garage door with side hinged timber doors then another thing to be aware of is the fact that with new timber doors you may be able to gain a bit of extra height within your opening – all important if you need to garage a larger vehicle like a 4×4 or van. Quite often you’ll find above your up and over garage door frame a panelled section, this can quite often be removed resulting in a taller opening for your new side hinged wooden garage doors! Below shows a new pair of side hinged wooden garage doors made to maximise the full height of the opening. The up and over doors are actually on the house next door. Same size garage but with full height garage doors once the panelled section has been removed!